In the warm Cuban twilight, the silhouette of a man can be seen wading in the pool of the Hotel Nacional and smoking a long, pungent cigar. 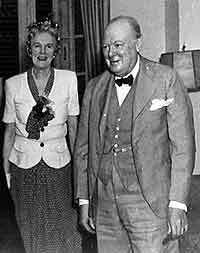 Forty years ago, it could have been Winston Churchill, who had an affinity for this grand hotel in Havana, but today it is simply another tourist enjoying the facilities at the city's finest hotel. The Hotel Nacional showcases old Cuban traditions for luxury and service and suggests that they have not been completely forgotten in the wake of the 1959 Revolution. A face-lift costing $64 million has brought the hotel back to its former glory. Everything-the simple yet tasteful rooms and apartments, elegant dining areas and vibrant swimming pools-has been restored. Located on a small knoll overlooking the entrance to Havana Bay, this stylish Havana accommodation was originally built in 1929-30 through a joint agreement with the Cuban government and U.S.-based banks. American companies designed and built the Nacional, and as soon as it was completed, tourists from America flooded the hotel's spacious reception areas, dining rooms and gardens. It was "the" place to be in Havana. This hotel was frequented by film legends like Frank Sinatra, Errol Flynn, Clark Gable, and Ava Gardner - their pictures decorate the walls of the hotel's café bar. Hotel Nacional is inextricably linked to the mobster years. In 1946 Lucky Luciano called a summit at the Nacional at which the carving up of Havana was on the agenda. 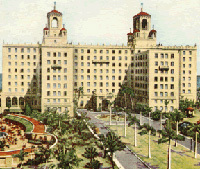 In 1955 the Nacional's casino and nightclub were opened and managed by Meyer Lansky. In 1990 the government decided to renovate the hotel and bring it back to its showpiece status. In May 1992, the 483-room hotel reopened, catering primarily to businessmen and high-class tourists. Unlike most other hotels in Cuba, the Nacional does not focus on the package tour business, giving it an altogether more professional and luxurious ambiance. 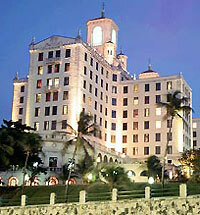 The Nacional is now a major business centre in Havana. Businessmen are in abundance, speaking English and Spanish and making deals. The Hotel Havana Libre used to be where the deals were made, but the power centre is quickly moving to the Nacional. There's even an executive floor in the hotel with concierge service, meeting rooms, faxes and computers. All the guest rooms have air conditioning and are well-equipped with minibars, direct line telephones and cable television. 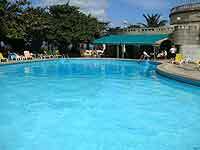 However, this doesn't mean that you can't come to the Nacional just to relax and enjoy the Cuban weather and culture. The main swimming pool is large and extremely welcoming after a hot day spent on the Havana streets or visiting cigar factories. There are few things better in Havana than taking a quick dip in the pool and then sipping an ice cold Cuban beer while overlooking the cityscape or the bright blue Caribbean. 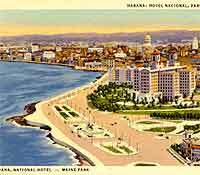 A three-minute walk from the hotel and you are on famous Malecon Boulevard, which runs along the rocky coast of Havana. In addition, the hotel has a good gym, tennis courts and plenty of gardens to stroll through. Finishing the day in such a glorious way, it's easy to see what Churchill liked about the Nacional - or whoever it was in the swimming pool that evening.